Local TV Stations have embraced Facebook Live as a valuable social media tool for audience interaction and “brand building. Once looked at as a second screen opportunity, today’s broadcasters see social media as a vital tool in reaching and engaging viewers in the most intimate and authentic way possible. WCAU-TV, the NBC affiliate in Philadelphia, recently streamed exclusive interviews and content from its hometown Eagles Super Bowl LII preparations, and later as the entire city came out to see the team and MVP Nick Foles raise the Lombardi Trophy. The station also regularly creates smaller hits for weather, teasing features for later broadcasts and even behind-the-scenes looks at the station and its talent. Some call it “brand building” while others see the opportunity to connect directly with individual viewers in ways not possible before. That can mean higher viewer retention and financially beneficial ratings. And when breaking news happens, the station can go live on Facebook before the TV crew even gets to the scene of a news event. The online platform also allows news stations to present longer events, like a town parade, in their entirety while reporting just a few short clips on the linear TV channel. And they can also get closer to the event with a small camera and live encoder. For viewers, media consultants agree that the cell phone is a very personal device and the prime target for today’s station marketers. If a broadcaster is able to reach that phone, they have achieved something very valuable to the station and its anchors’ personal brand as an on-air personality. The Wowza ClearCaster auto-configures live feeds to provide highly reliable, broadcast-quality streams that help facilitate an authentic conversation with audience members that keeps them coming back. He said that a team at Facebook approached the engineers at Wowza to help enhance its Facebook Live Publisher API in a way that traditional broadcasters, which have mostly avoided the platform due to fears about reliability, could clearly understand. Wowza has been a pioneer in streaming software since 2006 and now supports more than 20,000 users of its Origin server and Wowza Streaming Cloud service technology. This includes high-profile customers like SpaceX and government agencies to the Vatican and virtually every major broadcaster (including NBC at the Winter Olympics). The company’s new ClearCaster product is a 1 RU streaming appliance that supports 1080p60 HD and 4K UHD signals through 12Gbps SDI as well as HDMI. There’s also a small LED screen to gain access to software menus, including the display of virtual audio meters to keep an eye on audio levels, network connectivity and stream status. Audio levels are also visible on the confidence monitor and talent view for quick reference. The main challenge was, “how do you build that kind of broadcast-quality redundancy in a live streaming box.” All of these performance features are built into ClearCaster, which uses x264 compression today (a higher level encoding technology than standard H.264 AVC that provides better bit rate encoding and therefore better performance) and is ready to support H.265 VP-9 encoding. This allows it to also encode 360-degree and virtual reality video to create captivating experiences for online viewers to keep them coming back. “Talent View,” aka, confidence monitoring, allows the on-screen talent to see live Facebook comments as they are coming in and respond in real time. There’s a pairing code needed that allows the user to connect to their Facebook account. From within Facebook you start a live stream. 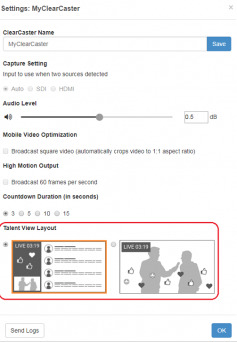 There’s an option on Facebook Live that allows users to select ClearCaster as a paired device. It pulls up a preview window and allows you to set certain parameters. Or you can schedule a stream to go live when you want it to (up to 10 days ahead of time). There’s also an HDMI out on the box that can be connected to a preview monitor, which then acts as a confidence monitor for the talent on screen, providing among other features a frame-accurate countdown clock (that is important to broadcasters). There’s about a 10 second delay between the talent and the audience. Other systems on the market introduce up to a 45-second delay, which Michaels said Wowza (and Facebook) finds unacceptable. “The faster you can react to a viewer’s comment the more they think you are personally engaged with them,” he said, adding that the ClearCaster takes just five steps and less than 3 minutes to set up. Priced at $2995 for the ClearCaster 1080 HD version and $6495 for 4K, some network configurations and automatic software updates are sent from Wowza for free (which takes minutes to complete) and ClearCaster comes with a three-year hardware and software maintenance and support warranty and 24/7 phone tech support. This product will soon (at NAB 2018) also support syndication, e.g., delivering content to other social media platforms like YouTube or Twitter—using a Wowza Stream Cloud account— simultaneously. And users will also be able to set up the box to automatically fail-over to a second ClearCaster box, located next door or across the world, if you have paired them beforehand. Introduced in 2016, Facebook Live is still in its infancy but is growing more important all the time. It started out as a way for people to go live on mobile devices and share what’s going on in their lives at any given moment. The results have been both highly entertaining (e.g., music artist creating their music for fans in real time) and stunning (as news events have played out for all the world to see). With the popularity of people watching live video, the Facebook Publisher API and creating RTMP ingest (stream packaging) for people to go from encoders or streaming services has increased significantly. While growing so quickly, one of the overwhelming problems has been reliability and streaming success. With all of the successes, there have been a lot of performance issues and processing stages that need to be coordinated, as well as provisioning of bandwidth to ensure success. Wowza thinks it has those challenges solved. For broadcasters, that does not mean “did I get the stream to the platform?” but how engaging was I with my audience. Did I get likes? Did people comment? Can I respond to them in real time? How do I create an engaging program that gets people to interact in a meaningful way, and establishes an authentic interaction with them as well as increases their trust and loyalty so that they will come back again and again?